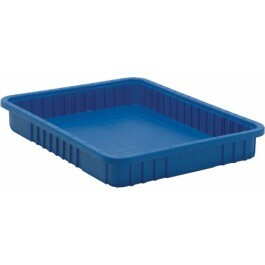 22-1/2"L x 17-1/2"W x 3"H USA manufactured, heavy-duty Dividable Grid Plastic Containers can be used in industrial, commercial, retail and healthcare industries for storage, assembly, fabrication and distribution applications. 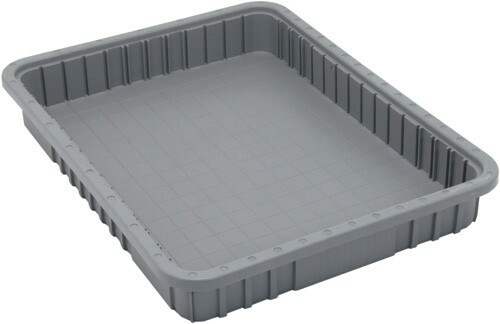 These containers offer the safest and most efficient method for compartmentalizing and protecting small to medium sized parts. Dividers allow you to customize the container's interior to meet your exact needs. Dividable Totes and Covers are available in Blue, Gray and Red. Covers are also available in Clear. 20-5/8" x 15-5/8" x 2-1/2"